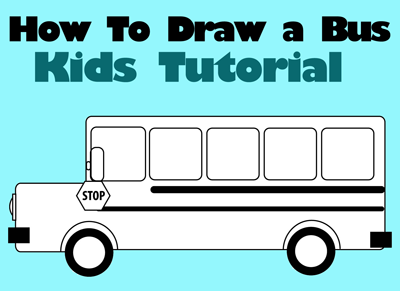 Learn how to draw a cool looking school bus with easy geometric shapes. If you can draw rectangles, ovals, and circles, you will be able to draw this neat school bus. Come take a look at the easy-to-follow steps to see if you want to complete this lesson. Have fun! Start off by drawing a rectangle. Then add rectangles for windows. Draw long, long ovals below the window. They go almost all the way across the length of the bus. Draw wheels by drawing 2 circles. Draw a square at the front of the bus. 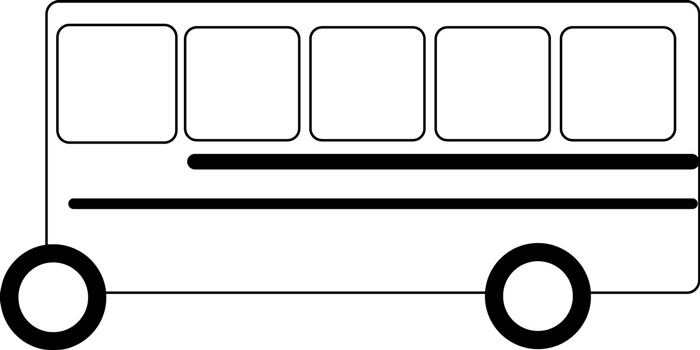 Draw a rectangle at the front and back of the bus for the bumpers. Draw a rectangle and half of an oval for the headlight. Draw a curved line above each wheel. Draw an oval for the mirror. Draw a smaller oval attaching the mirror to the bus. Then draw 2 lines … in between those lines write ‘STOP’. Draw a sideways letter ‘V’ shape on both sides of the ‘STOP’, so that you connect the top and bottom lines of the stop sign together. You now have a finished drawing of a school bus. Color it or decorate it any way you like. I hope that you had fun!!! Come back soon for more tutorials! Not very good but followed steps. This article was written on 15 Sep 2015, and is filled under Drawing for Kids & Preschoolers, Drawing Vehicles.